Please double check your variable name, the one you typed above doesn't match the recommended name. Setting PV_OFF_SCREEN_SIZE_LIMIT = 2048 has fixed this problem on all of our machines with Intel graphics. This works on both Windows XP and Windows 7. We also have had these goofy issues with printing,, Shown above, or blank screen... This started happening when we switched from raster to PDF publishing. I appears to me that the publisher was set for 300 dpi, and anything above that looks like this as far as viewers go. I finally figured out to change the local PDF viewer/printer to 300 dpi, and this resolved this issue for all users. I tried to change the dpi to 300 and lower. Still no success. 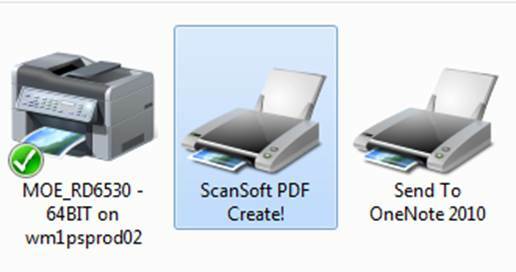 Do you have Adobe, or Nuance or PDF set up as a system Printer.. i.e. Set up as a printer? That needs to be set up with the dpi at 300. See below image. If so, run a test by Printing to it with a preview and see if that works. Just changing a viewer will not do it, from what I have seen. If one of the responses helped resolve your issue, would you please mark it as the Correct Answer? That way other users visiting the discussion will know; as the correct answer gets copied right below the question.